image of my "3 scoops"
Just the other day, I had sort of what I like to call a Super Mom melt down. I had glommed on way too much, things were back to back and I felt squeezed and squashed by the end of the day. After a storm, one always has the ability to see things more clearly. 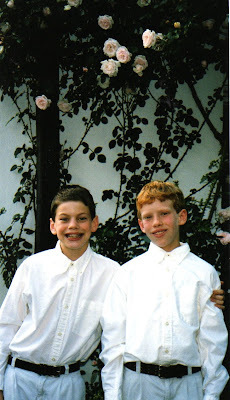 Just yesterday, I came across these photos that take me back to a kinder and gentler time. A time of anticipation for my roses to bloom, right outside my door, a time preparing for our local Spring concerts at our school and a time of rewarding my 3 scoops with an ice cream after a job well done. I always tell people, I have 3 scoops. One "Chocolate, one vanilla and one strawberry." When you see their hair-color, you get my point. In my melt-down, I failed to see all the goodness, and all the rewards of my labors. How lucky am I to have 3 healthy scoops. That said, after a visit to the pediatrician that we have been seeing for nearly 12 years, (my sons now tower over him), I was reminded of how important it is to allow time for "reward", for "praise" and for 3 scoops of ice cream. So when the going gets tough and you need to take a break, I suggest "Ice Cream." Exactly where we were headed when these photos were taken years ago. This reminds me to take time for life's sweetness. After all, one is never to old for Ice Cream, especially on a hot day. We went to a diner and had 3 scoops. We all left happy and smiling, a sweet reward. Frogs legs are a delicacy in France. My eight year old daughter was open and willing to try them and she wanted them everywhere we went, "Do they have frog's legs?" I thought that this print would be a fun design for her in a bikini or perhaps a tie for her Prince of a Dad! mine. 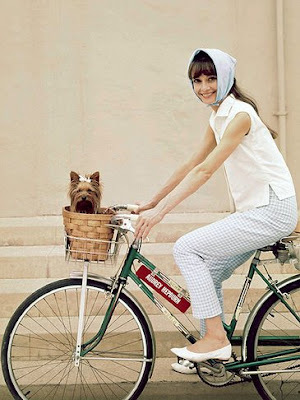 She makes riding a bike look chic and fun. Her little friend certainly adds an allure to the photo. I can't but help of think of Dorothy and the witch riding her bike with Toto too, "I'll get you my little pretty." 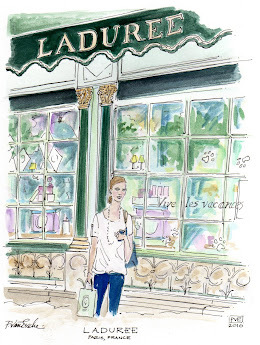 I could not resist taking this photo of this illustration while in Paris. This was hanging in front of the Library. Parisians ride bikes to get around and they always manage to look well turned out, sporting suits, dresses and often a basket or bag is in tow with a baguette of french bread. Now that is what I call the "perfect accessory." So to the drawing board I go inspired by these ladies and their jaunty bike rides. 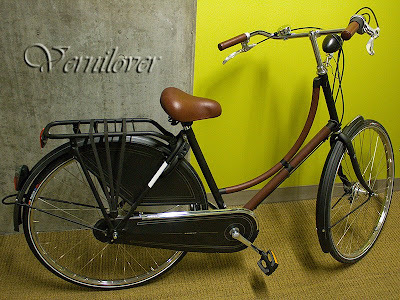 For my elegant ride, I will pick this chic ride from Venilover. That leather seat reminds me a a stunning saddle. I quite like the "horn" to honk! All I need is a basket and a little pup for my perfect ride. Look at what I found for only $1.00 at a Antique Fair while we were at the North Fork last weekend. 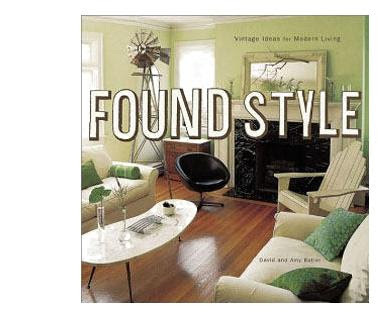 I am loving this book, chock full of inspirational vintage ideas for modern living. 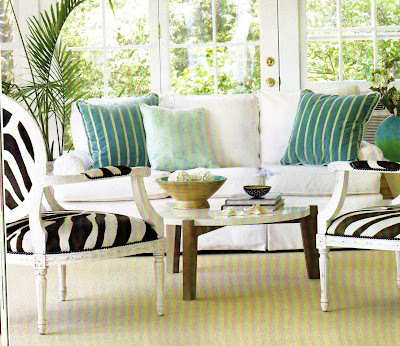 image from inside "Found Style"
1. Use restraint with the objects of desire. 2. Blend old and new. 4. Buy pieces with a purpose. 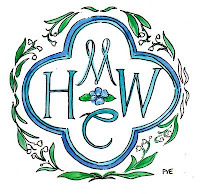 I looked closely and yes folks, none other than the dynamic duo of David and Amy Butler who own and operate Art of the Midwest, a design studio in the small town of Granville, Ohio. I really love the logo. 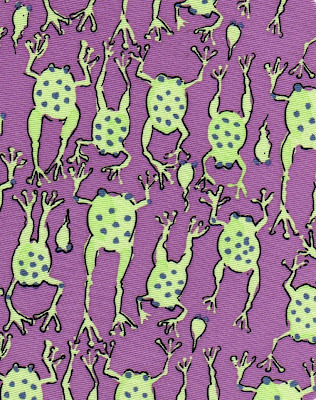 I also am a fan of Amy Butler and really love her textile designs. 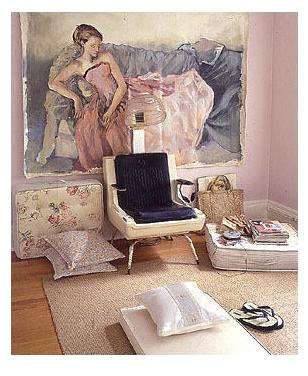 Look at this lovely girlie portrait, the palest shade of pink hangs as the keynote, with a neutral stage of seagrass and a hip chair to sit and peruse some books or the next best thing, the floor and a soft pillow. Style is truly where you find it and not something that can easily happen too fast. One must let their own style evolve over time and find it along the way. How have your found your style? Care to leave a comment, please share. pve design has been added to the Best of the best at Alltop. 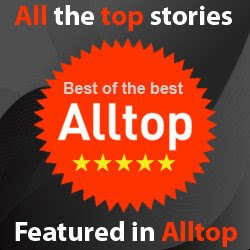 You cannot imagine how honored I am to be featured on Alltop, in the Art Category! Take a look! 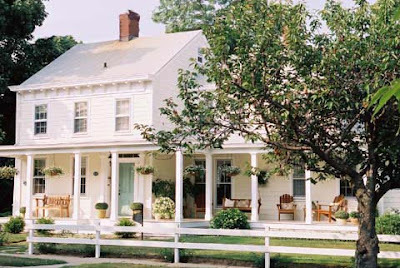 The Mr. and I are off for a weekend of fun and frolic (sans the children) We are heading to the North Fork of Long Island, to Orient Point to attend a grown-up birthday party. Much of the area was potato fields. 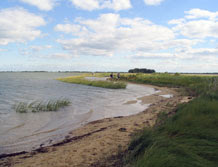 Now it is vineyards, beach, charm and yes a few potato fields still exist. The views are wonderful, the smells are salty and the air is plenty. We hope to have dinner one night at here. Hope to take a walk here and to dip our toes in the water. We are staying at at B & B, and most of them are quaint, like this idyllic spot. 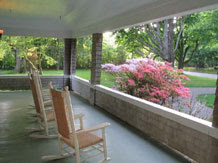 Porches, rockers and green grass. Blue water. Fresh fish, potatoes and hopefully not too much traffic on the North Fork. Happy Weekend. 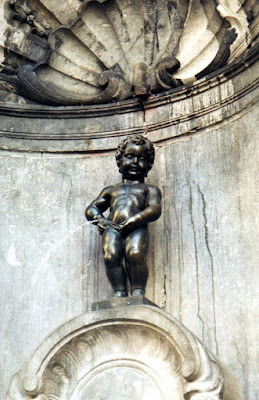 While touring Brussels, a visit to the "Grande Place" is always a must and just off the square, there is a famous little boy, "the Manne ka pis" - a statue of a little boy sprinkling and tinkling! This statue is dressed up on Holiday and other days, simply sporting his "birthday suit!" 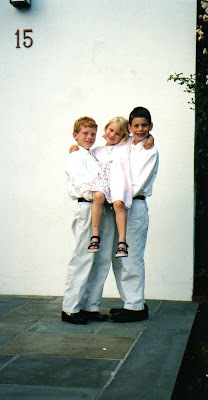 A visit quickly takes me back to the days of potty training twins and setting up a routine for them to successfully make the mark. I know that many of you will appreciate the success and the rewards of having no more diapers to change. Children along with adults find humor in this little boy. Around the area, one can find lots of souvenirs of this statue. We happened upon this Artist, Ziaeian, who had a booth set up and the most charming illustrations. 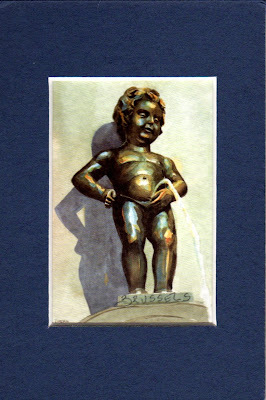 We could not resist to purchase this small work of art to hang in the bathroom. 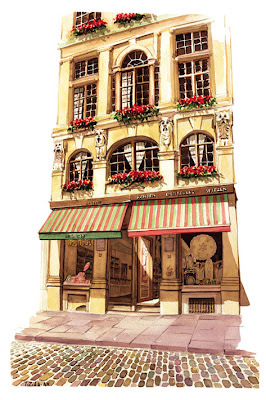 There were other illustrations that I loved as well, take a look at this lovely building and those gorgeous flowers. An awning always adds a smile to a building as well as protection from a different sort of shower. Speaking of showers, it happens to be raining here today. Thank heavens for little boys and for showers too! Have a sunny day. 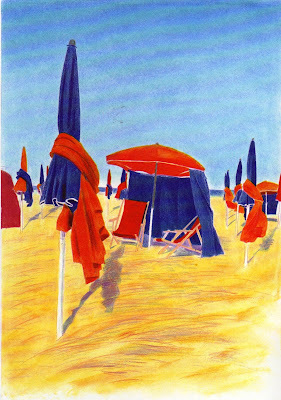 Illustration by Glynn Boyd Harte from "Mr.Harte's Holiday"
Glynn Boyd Harte takes us on a Holiday to the north coast of France, celebrated by generations of painters and writers, from Eugene Boudin to Marcel Proust. The above illustration by Mr. Harte takes us to a wide expanse of Beach, of an old-fashioned sea-side resort. I love this work for the use of a limited color palette of red, yellow and blue. The majestic shadow cast of the umbrella in the foreground leads us towards a promenade of beach chairs and cabanas. The northern light gives a golden glow to the sand ready to greet those on Holiday for a day at the beach. 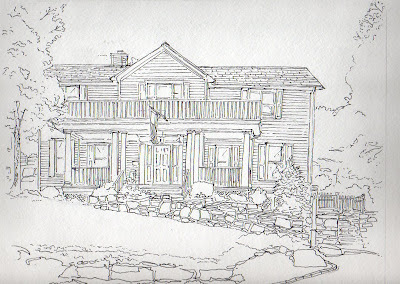 I hope that this inspires each of you to begin with a simple primary palette and take your sketch-book on Holiday. Isuwannee lives in this shady spot that I illustrated for her some time ago. Creative license gives me the ability to visualize and to transform things. 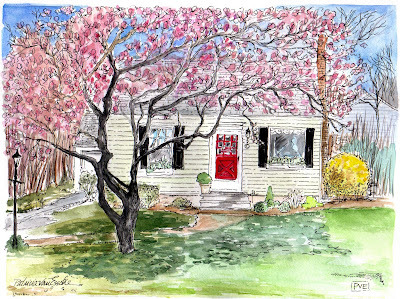 No need to call the landscaper or the painter, with the click of my pen and brush I can add a shady tree, a fence and some color - all to make your home all the more sweet to come home to. Pencil is used to "rough in" the shape and size on the paper or the image and then a micron archival ink pen is used to fill in the details. The devil is in the details. It takes time but a little patience here is truly a virtue. Working from top left to the bottom right keeps my artwork clean. I use a Mars Staedtler to erase the pencil prior to painting and a drafting brush to dust off the surface. At a point that I feel I have captured the essence of the artwork, then I begin to prepare my color palette with the colors to be used. I try to narrow down the number of colors and stick to using that palette which brings a cohesive order to the final artwork. I use clean water in a clear glass container , good brushes and have a blotter or a paper towel to test the amount of paint that I load on my brush. Just like applying make-up, if it goes on too dark, you have to start over. I try to work light to dark in water color, but in oils my process is different. I plan to post more about my process and if any of you have any questions that you would like to know, please feel free to leave me a comment. 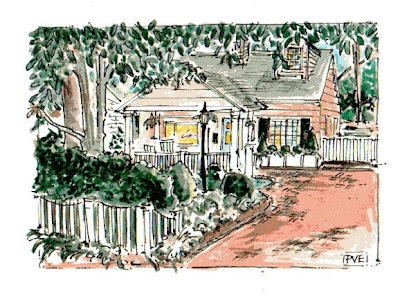 Creating illustrations and inspiring others to draw or paint is pure joy. Tell me if I have inspired you and let me know what you are creating! Maison 21 decided to up the voltage and raise this chandelier found on e-bay as a design challenge. It caught my attention over at Mrs. Blandings as she designed a chic Bordello for a "quick" visit of pure and utter decadance. Next, off to Katiedid where I sported my muff and my portable flask of vodka as temperatures dropped and lead me into no mans land to an icebound dacha. I was quite happily snowed in there, which then led me to my own challenge of flipping my own switch, to "Le Voltage." "Entre, s'il vous plait" to "le Voltage" - through this gate for an evening that you will never forget. I felt that this chandelier needed sharing for all to see and a setting commensurate with it's grandeur. I mean it would be perfect in a Master Bath but then again, how cruel not to share it with the world. Philanthropic interests at heart. 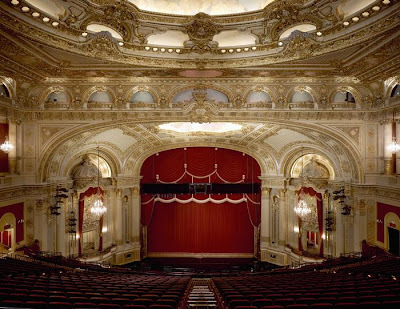 Le Voltage was designed after Versaille and I have decided to add an opera house there and invite each of you to a grand fete! Nothing to wear, I am sure that you can come up with something to promenade along the red carpet as you have made the cut for an evening of total excess in a rather gloomy economy. Just what the Doctor ordered to make us feel happy, a night out of high voltage to electrify! Blinded by the light, perhaps a pair of these would help to cut down on glare. Dolce & Gabana has these for $386,ooo. Not to worry, they are in the gift bag along with some other goodies, that will be handed out after you pass the gates. 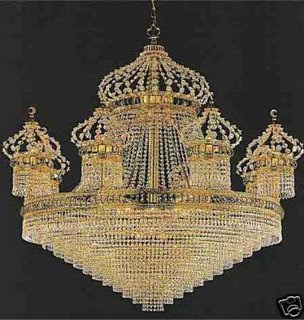 I mean if I can afford such a chandelier, surely, I can afford to give each of you a party bag. Hurry take your seats as the performance is about to begin. Now that you are seated, turn off your cell phone and put away those noisy candy wraps and anything else that might ring, or bling during the performance. Quite a venue of star performers on this evening's program, Kiri Te Kanawa, Madonna, Prince and several other surprises. Sit back, dim the lights, and let the evening at "Le Voltage" light up your mind and your hearts. Fireworks to follow the show in the formal gardens along with refreshments. r.s.v.p with a comment for me. While we were in Europe, visiting Brussels, one of the highlights of our trip was a visit to the "Atomium." 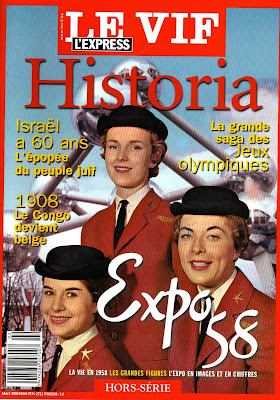 Once upon a time in 1958, at the Brussels Fair, Expo 58 there was a certain fair hostess greeting tourists and working as one of the fairest of them all. My mother-in-law happened to be a fair hostess, one of the top 3 out of 500 hostesses. She recently attended the 50th Anniversary Party for Hostesses. PARIS Match "Centerfold" - my mother-in-law happens to be on the fold. She told me one of the most important responsibilities as a Fair Hostess was that of "hygiene"
and that a part of her job was to inform other Hostesses that they were to return home and come back for lack of proper hygiene. Can you imagine? Today, we (Americans) take for granted the daily showers and shampoos and all the products a plenty to keep us fresh as daisies. 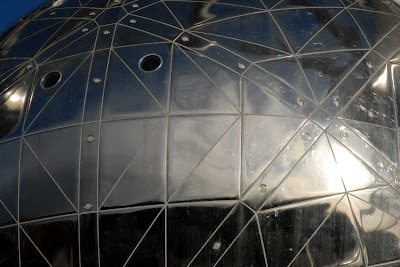 The "Atomium" is an amazing architectural wonder. Recently restored for the 5oth Anniversary, polished to an incredible silvery sheen. The structure is a series of round balls connected, like that of an atom. The connecting structures are a series of stairs or elevators taking one to the pods for various exhibits. 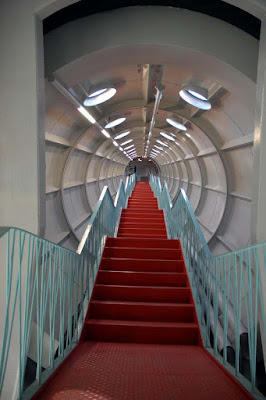 If you are ever in Brussels, take a trip to the Atomium. You will be amazed at how many tourists are there. I was thrilled that we were able to go and that our children saw photos of their Grandmother their on display. We were so proud of her. She still reigns fairest of them all to each of us. 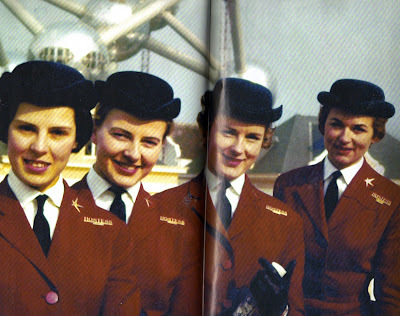 Happy 50th Anniversary to you and to the Atomium! There is nothing finer than a red door. This illustration was done for a client who is working on a special surprise for her husband while he is away, (this illustration being one of the surprises along with another one, a secret!) So nice to come home to surprises and to be a part of a surprise. Do you have any surprises in the works? I just love surprises. I like red doors too. Tis so much fun to shop on location, and to associate a memory of a special purchase from a far away spot. A bag, a beach hat, a skirt or pareo, items that add sunshine to your ensemble. Books are also wonderful to bring back and savour, a local cook-book or local artist's book. Summer would not be complete without a ferry ride from the Eastern shores to Nantucket, Martha's Vineyard or Block Island. What is your favorite island? 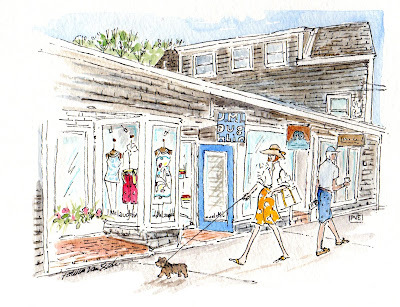 Where will you be hopping and shopping this Summer? Brooklyn Limestone posted this empty frame - part of her "trash to treasure" collection.She found them while on her hunt for her sofa. They were literally in the trash. What a steal. She posted them on her blog looking to readers for help, the frames were missing something. Help being in the form of ideas left as comments. Funny, when someone asks for ideas I can pull them out of a hat. 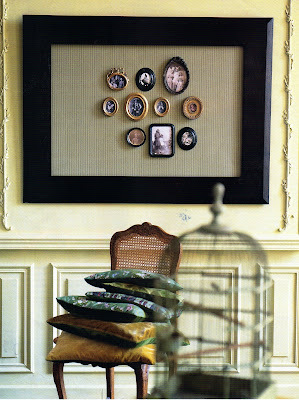 I happened to find these great photos in a European Magazine at the Paris Apartment from the 1990's - which I was delighted and thought they would be just the thing for Madame Limestone. Borrowed ideas, not stolen. 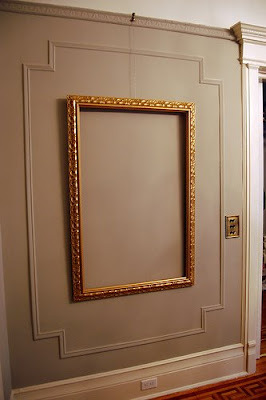 A perfect solution for the case of the frame missing the art. What thinks thee? These items of a personal collection suddenly become transformed into one private place of honor. Perhaps a scrap of wallpaper serves as the perfect back drop to off set a collection. Don't you just love the mix of frames within frames. I could see some of those fabulous old keys displayed in frames that Madame Limestone found during the renovation. These remind me of my teenage "shadow box phase" as I made them for gifts. Elegance is in bringing a collection to one particular spot. 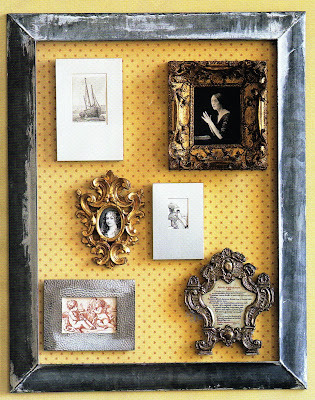 Mixing minimal with baroque or family heirlooms all provide for a unique private collection. What would your private collection be? Do tell. This gives me impetus to hang my illustrations in one giant frame. 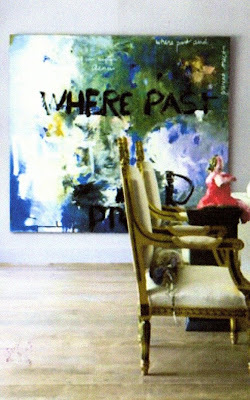 I know my framer, Elegant Poster will love this idea too. "Cha-ching" as my daughter likes to say, unless of course, I can find some frames in the trash. 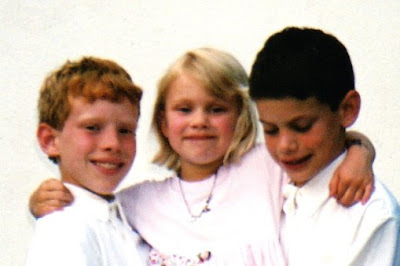 Family love is unconditional along with a circle of wonderful friends who mention you in the August 2008 of Family Circle. For a buck ninety-nine, I encourage each of you to get your own copy or subscription. 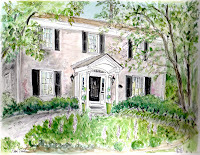 I posted the illustrations awhile ago that I had done for Connie Dirvin of interiors of her fun home. 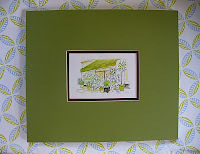 Take a look on page 24, at her "Fun House" and be inspired to add a little fun to your home. I have to admit, I was in earnest hopes that my illustrations would make the cut, but I am so thrilled that pve design was included in, "A few of Connie's favorite things" on page 28. 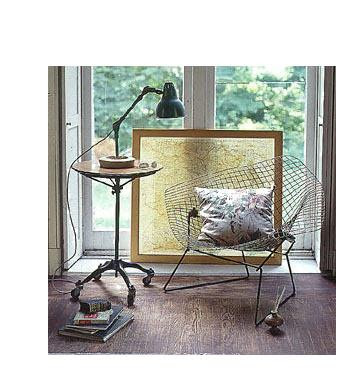 Connie has a fantastic site too which is a great online home design shopping guide - blink decor. 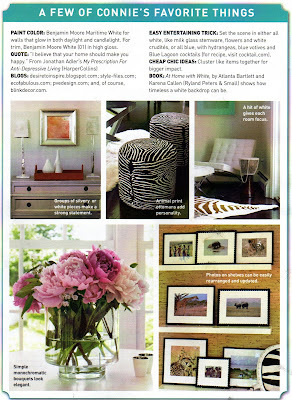 Connie along with Anne Carr partner to edit the market and introduce strategies for keeping decor fun. Connie and I worked together years ago and remained in contact with the annual Holiday Card. 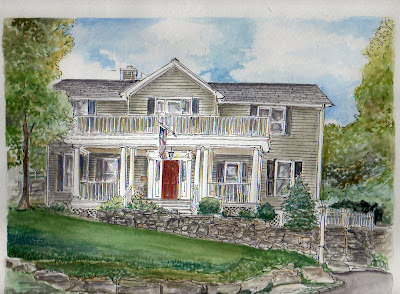 Connie would call for a variety of artworks that she would ask me to do - such as, a personalized illustration for her father's birthday invitation, place-cards for an at home dinner party with clever quips, and an illustration of her interiors, an illustration of her former Connecticut residence. I feel so included, like having my very own "Circle of Love." Connie can count on me, in the blink of an eye, I would illustrate anything for her, even her dog, Chloe! Dutch treat in America translates to paying one's own way. Prepare yourself for a real Dutch treat. 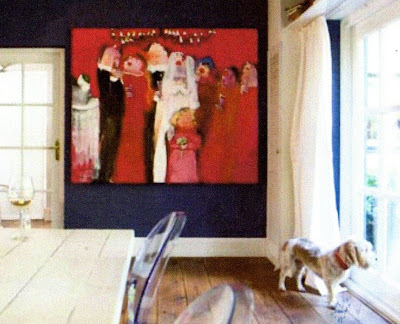 Please allow me to introduce you to a talented and spirited Dutch Artist, Gerdine Duijsens. Gerdine was introduced to me via a dutch cousin Babette Raymakers, living in Brussels. As an artist, people always love to connect artists and networking is good thing, especially when most artists tend to work alone. I am always flattered to connect and to be inspired. As they say, "flattery will get you everywhere!" Gerdine began her love for art by drawing at an early age and later attended the Academy of Art in Utrecht. She is a mother of 3 gorgeous daughters. She and her (late) husband managed Veterinarian Practice of Horses and Cows. He past away last year. He was her most supportive person and encouraged her to attend the Art Academy in Belgium when her daughters were in high school. I am impressed as she managed to do this part time. Inspiration came through the beauty and movement of owning horses that inspired her to paint them in an abstract way. (see her site to view the horses!) Gerdine is also in touch with the people and paints them in a way that shows them larger than life in order to show life above the ridiculous often in arrogant settings such as in a formal social setting of a cocktail party or a concert. Her favorite colors are reds and pinks. 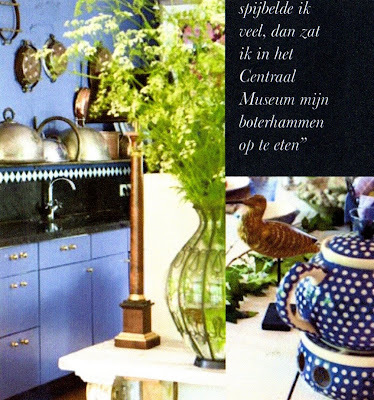 photo of Gerdine's blue kitchen with lovely copper pots. I can imagine this blue kitchen to be enjoyed by many, just as many enjoy her artwork. 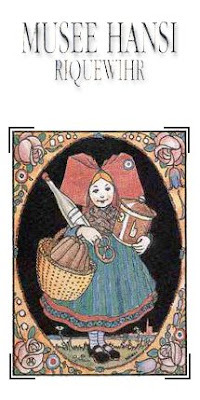 Please take a moment to stop by and visit Gerdine, she is after all a real Dutch treat. Please tell her it is on pve design! I hope to make it to Holland and meet in person and enjoy a cup of tea or coffee and see her artwork. It would be my treat! Please contact Gerdine if you are interested in purchasing her work via her website. "Home again, jiggety-jig!" Lusting over this lovely yoga retreat in my back yard to get back to yoga. Our trip to France was fun, fabulous and fine. However the scale God is not happy with me and is commanding me to listen to my inner body and back to fruits and veggies for this little pig. 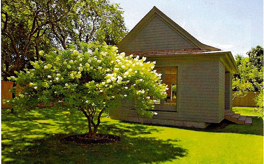 This little home could also double as my art atelier! Huf and I huf, back to work, yoga, tennis and swimming. What are vacations and weekends for if you cannot enjoy, within moderation! Enjoy your weekend where ever you may be. Alright, my last post from Paris. I was lucky to have this sweet from Pierre Herme here in Paris which my sweet sister-in-law served for my in-law's 50th wedding anniversary. Rumor has it that she was on a quest for the best in Paris. 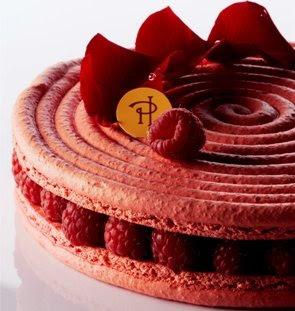 Pierre was one of the top patisserie chef's at Laduree and then went out on his own accord. His tastes are modern, fresh and flowery. A beautiful shop for the senses and for the sweet life! J'aime les sweets in Paris! 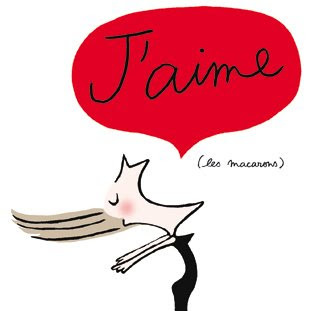 Illustrations by "Hansi" - an artist of the Alsace Region of France. Please excuse my lack of posting. Internet access was not available at my dismay. We just spent the last few days visiting "Alsace" and stayed in a quaint village in the L'Andlou region not far from Strasbourg. Flowers were in bloom and filled every window box and lined every bridge. We even saw one box with a note that was pardoning the lack of blossoms. These people take great pride in their flowers. It was my first time visiting this area of France and we left wanting more. The vineyards, the countryside were all breathtaking. I kept remembering my Grandmother and how she would have loved this area. Tidy villages and everyone toiling at there calling. Statues along with crosses were at the entrance of each village. Faith and a grateful quality is necessary when you live in the place so lovely. One artist that I was not familiar with is "Hansi." 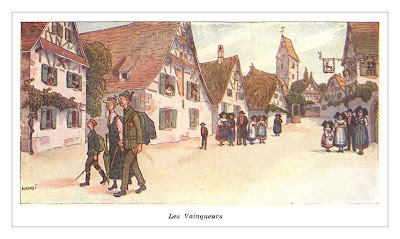 I will post more about this artist who illustrated life in Alsace. If you have not visited this region, I highly suggest that you take a trip. The people, the food and the wines were so pleasant.